5 Pillars of a perfect blogger design. Here I will explore the Tyler Cruz who earns millions through affiliate marketing and the most important part in his earning is being played by his blogger blog design. He completely focused to represent his blog as a brand and he got success too. So today I will share his design skills that made his normal blog to a perfect blog say brand. There are many things that you can learn through his blog like how to customize blogger sidebar, How should be your comment box, What to put in the sidebar so that it creates conversions and much more. Logo Says About Your Website. Now see Tyler Cruz website logo. His website logo tells the entire story of his blog or website. He writes about earning online and affiliate marketing. So how should be his logo? Well his logo should have some image of money and a happy moment too so that it inspires other readers to do affiliate marketing and purchasing. Smiley Face always Makes Other Happy. You can see his logo has an animated character who is happy because he has money and counting and showing us the money. This is the picture everyone wants to feel in reality. As we know he is operating his business through computer so he also put a laptop in his logo that shows that he is earning thorough working online. 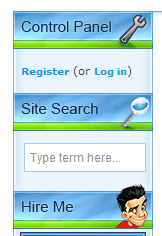 As we are discussing a perfect blogger design now see the sidebar of Tyler Cruz he has inserted a small image of his logo in the sidebar too. Giving and spreading a message of success through his entire website. All these leaves an psychological effect on the reader's mind like we discussed in 10 psychological blogger design tips that increase conversion. Similarly all of his tactics affects the reader's mind and helps him in achieving his goal of making money. Make a connection between your logo and sidebars. He never leaves a chance to promote himself. He always shares his income reports that inspires others and the same thing he does through his blogger blog design. 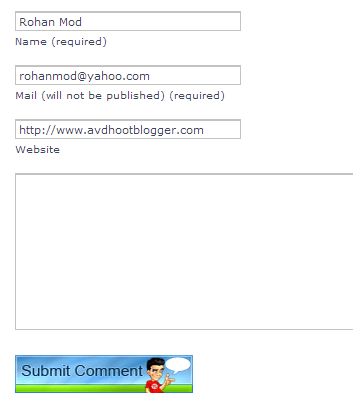 Now see he has put an advertisement in the right sidebar of his blog. Again he used an image of his logo. He still sticks to his theme. Again those happy faces inspire others and strikes the user's mind. As you can see his self promotion tactics. Promote yourself and your website. He has put that happy face in comment author image too. Again inspiring others and striking reader's mind. He still sticks to his blog theme. Try to use your characters everywhere like Tyler Cruz did. Stick to your blogger theme. Never use someone else's photo in a comment author image. As we saw above how he used his character image in the sidebar, Self promotion and comment author image but he is not limited here even he used his image in the comment box too. See the image above. Even in the end he is striking reader's mind and spreading a message of success. Tyler Cruz Website is an example of perfect blogger blog design and the above design tips are the main pillars to make your website or blogger blog a brand. 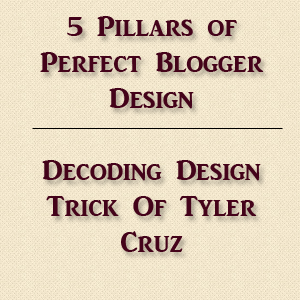 Description : 5 Pillars Of a perfect blogger design, What needed and how to make your blogger blog like a perfect brand like Tyler Cruz a perfect brand.